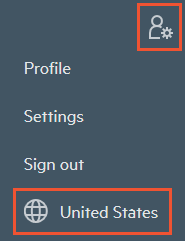 The language that HPE Support Center displays in, and country-specific contact information such as in "Contact HPE", are by default determined by the country you are accessing the site from. For example, if you are in Italy, the site appears in Italian, and the contact information is local to Italy. Several countries share languages, but the country-specific information is different. Ecuador and Mexico for example, share Spanish, but the contact information for each is different. Some languages differ slightly depending on region. The Spanish associated with countries in South America, for example, is different from the Spanish associated with Spain, and the Portuguese associated with Brazil is different from that of Portugal. Technical documentation also appears in search results, if available, in the selected language. You can use this feature to compare languages, if for example you are not sure of terminology in a given language. You can open a link in a new window, change the language in that window, and compare the different language versions of the same content. Once you change a language in one window, the language will change for subsequent links on the site in all open windows, and will remain your selected language even after you sign out and back in again. To return to your original language, select it from the language and country selector.